Monthly Report SfS helped the families Milić and Marković Serbs for Serbs visited two families last week. The first one was family Marković from Leskovac. They have seven members, father Goran, mother Olivera and five sons: Vasilije (2), Jovan (5), Dimitrije (8,5), Petar (9,5) and the oldest Georgije (12). Their father thinks that perhaps the reason for the lack of female child is a fact that Serbia will need soldiers to defend the homeland in the years to come. We also payed their electricity bill, bought the diapers for the youngest child, and several cough syrups. They also received some of the basic groceries from the football fans “Delije North” . Both the families Milić and Marković got the books of orthodox thematic. Mr. Goran gave us a present, 3 rosaries which he made by himself. He also thanked everyone who helped them and asked all the people of good will to contact him or to make a payment to his account. They live in a very difficult situation in one bedroom apartment, and the monthly income is 18 000 dinars. SfS provided what they needed most – washing machine and stove. Our next stop was the village Velika Sejanica, not far away from Grdelica. The Milić family is one of the poorest in the area. The family members are father Ranko, sons Nikola (10) and Aleksandar (20), and daughter Jelena (18,5). After giving birth to Nikola, their mother left them, so Jelena had to take her place in the house. Thus we focused primarily on helping her. We provided a freezer for the storage of food, and the new stove Smederevac to help them get warm through the winter. This was especially important, because the children used to get cold because of the bad heating. On Saturday, November 6, 2010, the representatives of the charity organization Serbs for Serbs from Switzerland visited in Ušter the „Majevica party“, traditionaly organized each year by the „Majevica Association in Switzerland“ headed by Miodrag Lukić, a Serbian writer living and working in Switzerland. We used this opportunity to promote our organization and sell the T-shirts „Još rađaju majke Obiliće“. We agreed with our host to forward 5 franks out of every sold T-shirt to the building of school in the village Tobut near Lopar in Majevica (Republic of Srpska), and the remaining 15 franks in a great Christmas action of our organization in Kosovo and Metohija. We managed to sell 42 Tshirts at a cost of 20 franks, so the profit was 840 franks (210 for school and 630 for the action in Kosovo). We use this opportunity to thank our hosts and all those who contributed to our charity work! Dragiša Radonja has five children: Mladen (13), Tanja (12), Sanja (10), Miloš (8) and Njegoš (1). All of them, except Njegoš, travel several kilometers to school, which doesnt prevent them from being good pupils. The family lives in Brezovica, municipality Pale, as subtenants, and paying the rent of 150 KM. Their property is on the demarcation line which prevents them from coming back. Dragiša is unemployed, but he manages to earn money on several jobs. We met this family for the first time within our Christmas action, when they found out for our charity organization. Dragiša managed to provide the school equipment, buy the food supplies and meet the everyday needs of his family, but he couldn't buy firewood. The municipality and the Center for social work couldn't help him. He called our organization because we were his last hope. The winter came sooner than expected, and the first snow pressed him to hurry up. Thanks to our donators, we managed to buy 10 meters of firewood. All the children, even the youngest, helped their mother to stack the firewood, while Dragiša was at work. Biljana and Dragiša are very young but hardworking and responsible parents who cannot provide more for their children, and thus have to ask for help in order to provide the necesarry for their children. Therefore, they thank very much our organization. Humanitarian organizations Serbs for Serbs continues to collect the funds needed to purchase tractor for family Ekmecic from Prebilovci village in Herzegovina. With the new 550 euro this month as we separated the ''Fund for tractor'' currently we come to the sum of 2000 Euros. Patiently we continue with this project in the hope that we will in due course to collect the necessary sum for purchase of tractors. On behalf of all of them, the Serb for Serb organization, and myself... Thank you. Zdravo, Hello, How are you doing? 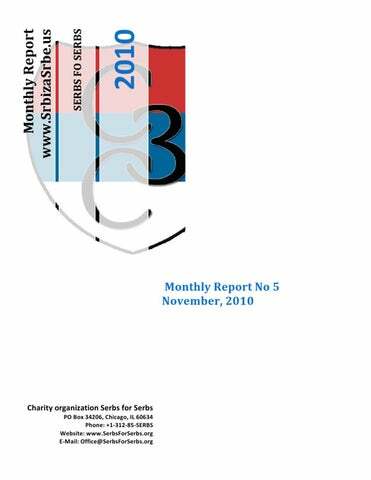 November 2010 Monthly Report -Serbs for Serbs Mesecni Izvestaj za Novembar Humanitarne Organizacije Srbi za Srbe u Americi.